Do you love bracelets like we do? If you are bracelet person, then you will adore our wonderful bracelet collection! 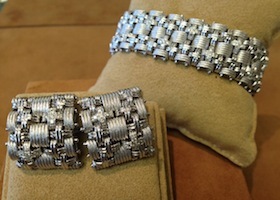 Not only do we have a wide selection of bracelets to choose from, but also offer an excellent custom bracelet service! We can resize any of our bracelets so that they fit your wrist perfectly! We can also help you design and create the style of bracelet you want. If you find a bracelet and love the gems, charm, or beads on it, but would prefer a different chain or setting such as white gold, yellow gold, sterling silver, or more, we can help you! With our experts working with you to create the look you want, we are sure you will be completely satisfied with your bracelet! We aim to provide the best customer service, so that you leave happy and with a piece of jewelry that you will cherish. With your personalized bracelet, you will be able to show off your fantastic fashion and style. Customized bracelets are also a phenomenal gift, as they will mean so much more to that special person in your life. Wearing bracelets that are customized to your own personal style will give you the pride and joy that a regular bracelet lacks. While your other bracelets are nice, customizing your own is a special experience you won’t want to miss out on! Come by Smoke Tree Jewelers today to create a fun and personalized bracelet that you have always wanted! Our experts will be more than happy to help you choose the right chain, setting, jewels, charms, and more to complete your dream bracelet!